Since this time of year is associated with giving, we thought that we would share a FileMaker iOS gift. 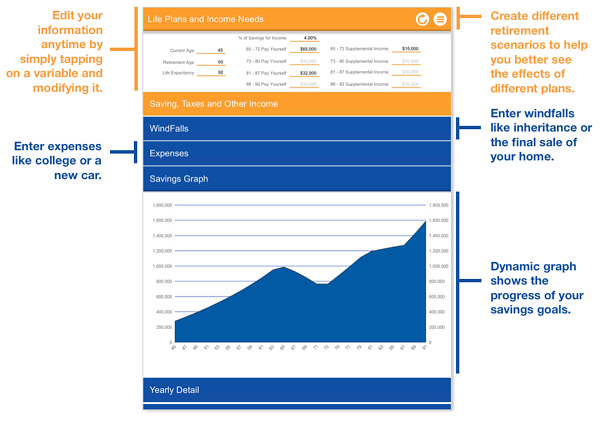 We created a retirement planning app using the FileMaker SDK. Some of us may find this app useful sooner than others, but we hope you benefit either way. The free FileMaker app is available on iPad only on the Apple App Store. After rooting around the app marketplace and doing some research on the web, we settled on a retirement calculator of sorts. A retirement planning app was appealing because there's no shortage of examples of data models and calculations. We knew we could just pick a few of these models and build the app around them without having to be too much of an expert on any particular one or even the field in general.